Free X-mas Story – Books, Sleigh Bells, Holiday Madness! 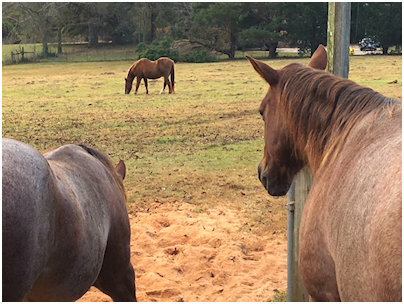 The first really cold spell hit this last week—and I blanketed the horses for the first time this year. 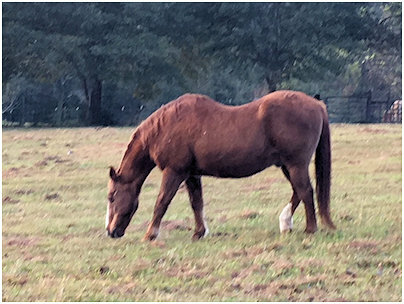 I have my two “baby girls” who are 13 and 15, but I also have a very skittish big red horse here named…Red. He is a rescue who belongs to a friend. Red has had a tough life somewhere along the way because he’s very untrusting. And even though he’s been here six months and I’ve fed him twice a day, every day, he still doesn’t believe I’m not going to hurt him. He will let me brush him while he’s eating, but he can’t be confined in a stall and he really doesn’t like to be hemmed up in any way. Mitch can catch him when he needs too, but Red is 33 and we simply try to let him live his remaining days in peace. I have a blanket big enough for him, but I am terrified if it started to flap, he would hurt himself in a panic. So I won’t put him through that. If he’s afraid of the baby girls in their blankets, I don’t think he’d much care for his own. But as the winter progresses, we shall see. He’s nice and fat now, but older animals have joint issues and the cold is hard on them. I wish he were more trusting of me. I keep thinking we’ll have a breakthrough, but so far, not yet. That’s what’s going on at the farm. And writing and reading. Dean and Don came for the Thanksgiving weekend, and we had a lovely time. 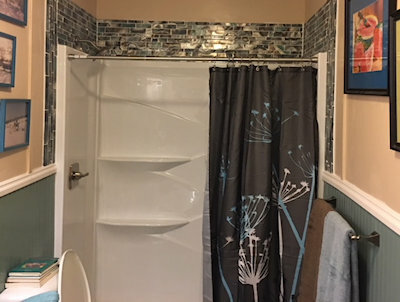 They got to use the new guest bathroom and declared it to be “perfect.” It was a relief to get that project done! I’m only lacking a mirror, because the one I ordered was too large. Luckily, it was perfect for a renovation project Jennifer, my niece, is doing. So it found a good home and I’m still looking for the right mirror in the right size. A sofa would also be helpful, since I sent a lot of my furnishings to the dump. Cats and dogs are just very hard on furniture. It’s just how it is. No point agonizing over it. 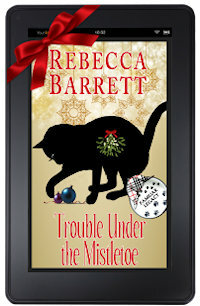 In the book world, please download Rebecca Barrett’s free Christmas short story, “Trouble Under the Mistletoe.” It’s a charming and delightful Christmas tale and a gift to the Familiar Legacy readers and my regular readers who have been so loyal. Merry Christmas! On January 8, Laura Benedict will drop the fifth published title in the Familiar Legacy series, SMALL TOWN TROUBLE. You are going to love it! It is so interesting to me to see how each writer relates with that black cat detective, Trouble. 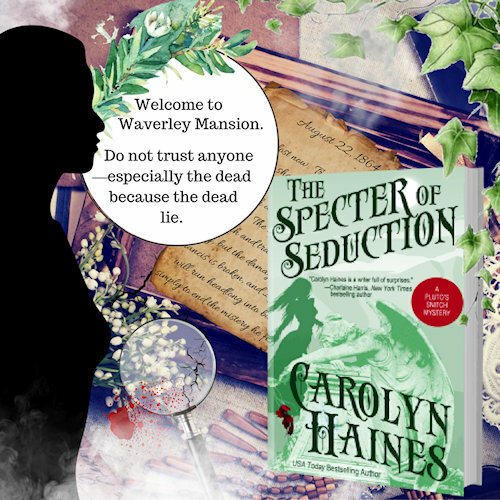 And my latest ghost story, THE SPECTER OF SEDUCTION, is getting some wonderful reviews from readers and bloggers. I am so grateful to the people in this industry who read and comment on books. And never fear that Sarah Booth is being slighted. 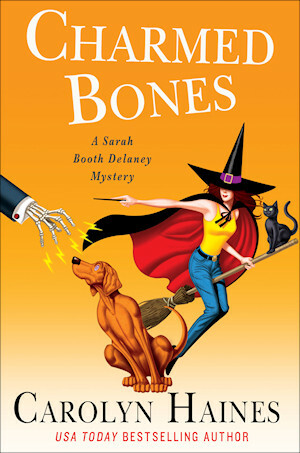 I’m reading the proofs for CHARMED BONES, due out in May. And I’m writing A GIFT OF BONES, a full-length Sarah Booth Christmas mystery. It will be available next October, I believe. In a bit of a departure for me, I partnered with the wonderful Isabel Brown, who was chairman of foreign languages at the university where I once taught. Isabel has translated PENUMBRA into Spanish. My first Spanish book! It will be available in e-book in mid-December. I am so very excited and it has been such a joy working with Isabel. She’s now translating TOUCHED into Spanish. And I will re-release both books in English! Fun. And I’m working on the next Trouble book from me, BONE-A-FIDE TROUBLE, due out next late spring. Don’t forget the many authors with books—TROUBLE IN DIXIE, Rebecca Barrett; TROUBLE IN TALLAHASSEE, Claire Matturro; and TROUBLE IN SUMMER VALLEY, Susan Y. Tanner. These books are in print and raring to be read! In my Trouble story, I’m going to blend two of my series—Trouble and Sarah Booth. 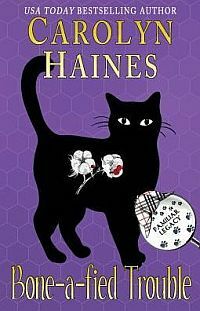 Trouble the black cat detective is solving a crime in Zinnia, with the help of Pluto the black cat. Folks in Zinnia think they are seeing double trouble! Just a heads up for a few events. Rebecca, Susan, and I will be at Main Street Books in Hattiesburg, MS, on December 4, at 4 p.m. with a large signing and with three of our Trouble titles in print. Charline McCord will also be there with A YEAR IN MISSISSIPPI, and I am also a contributor in that book. On December 2, I will be in Bay St. Louis judging a Christmas tree contest. The Bay St. Louis library does this every year and I am looking forward to it—and dreading it. People, those trees are dang spectacular and it’s going to be hard to choose a winner. But I gave my word so I’ll be there with bells on. Literally. Hah! And on January 14, Rebecca Barrett and I will be signing books (and giving away a chance to name a character in our next Trouble books) at Pet Supplies Plus on Hillcrest Road in Mobile. This is a Cat Carnival with a lot of special surprises for those who join us. Some local artists are making lovely clay gifts to sell, there’ll be refreshments, and much, much more. All proceeds go to support the Azalea City Cat Coalition. You can see why Rebecca and I are supporting it! Go cats! But the ACCC does remarkable work in the Mobile area to spay and neuter feral cat colonies and to help those cats live a healthier life. There is no telling how much suffering ACCC has stopped by neutering these feral kitties. Please drop by and join us and make a donation! Good work requires money and man power. Oh, yeah, and they’ll have pet food specials too! Don’t forget to enter my Monthly Contest — I’m giving away two ebooks of FAMILIAR TROUBLE! That’s the news so far. I can’t believe Thanksgiving is over and Christmas is on us. Maybe I’ll work on my “Sleigh Ride” tap dance just to terrorize my friends and family. Yes, I can see the panic on their faces now! There is a video of it (I took tap dancing lessons when I was in my late 30s—uh, not a lot of talent to work with) but that video I will not share! Searching for my tap shoes!